When my daughter and I finally get to the river bank, suited up and gear ready, I have to choose to breathe. We have been driving north for about four hours, and we are eager to see our destination. My heart rate went up once we left the car and started to walk down a dirt path. On summer mornings, you hear a cacophony of bird calls. The natural world is very much awake and alive while most humans still slumber. The birds are calling us to the river. As soon as we hear the sound of moving water, my heart jumps again. She chuckles, not in a mean way, but with understanding. She knows her father. In the ways of fly fishing, she is very much like him. We walk towards a favorite spot and are delighted that no one is there. We know this river now, and we feel it knows us. We approach it with empty hands and open hearts and walk away each time with fullness and moments of joy etched within. We hope we succeed again this time. We survey the beautiful water and the lush trees. Everything looks more green and vibrant than ever before. She steps into the cold water, fly rod in hand, and steps towards a spot that has rewarded her often in the past. 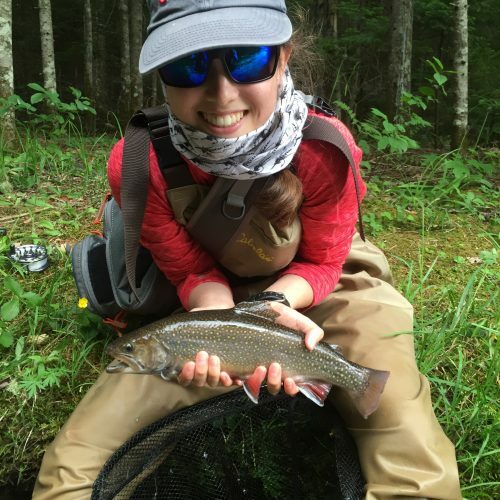 It is a familiar sight to me, she with a hat, sunglasses, waders, and eager to see fish. It makes me smile each time. We are in the northernmost part of NH, near the Canadian border. There is no cell-phone coverage, and we share a small room at a fishing lodge that is redolent with the scent of pine wood. We try to come each summer. It is a special area for me. One of my best friends and I came up here in 2007 to fly fish for the first time. Since then, I have taken each of my children when they are old enough to wade. I teach each how to fly fish. In subsequent summers, all of our children are invited. But, there is no pressure to go. Most like but do not love fly fishing. But, this daughter and I very much love it. Reading water and finding such seams is work. Some say it is a natural talent. Others say it is trial-and-error. I don’t know. But, 10% of the anglers out there catch 90% of the fish. That small group has a real gift, in my opinion. This young lady seems to have it. She pulls out line from her reel and casts. She throws her flies above the seam, and they glide down to the target zone. I watch her line. It is moving too fast. “More weight?” I ask. She nods. I clip off a fly and add a heavier one. I make my own flies. I’ve found some patterns that work consistently for this river during the early summer, and our fly boxes are loaded with them. “Good to go,” I say. I move to the shade next to the bank and watch her. She casts again and again. I look at our surroundings while mesmerized by the cold and clean water and the sound it makes. I watch the infinity of sparkles that the sun reflects on the river, like a galaxy of mini-diamonds, and slide into a familiar mental space. Now, time is suspended, thoughts of the past or the future fade, there is only now and this cast and this drift. 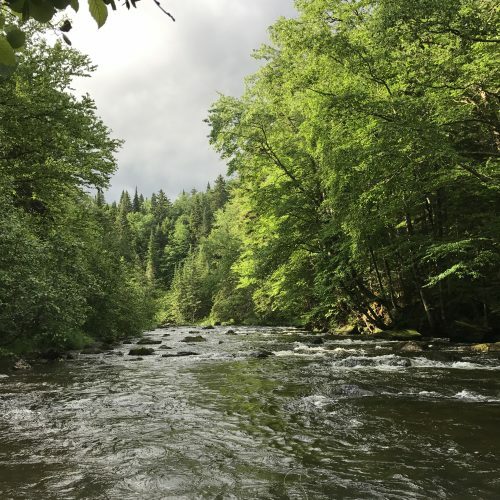 The fly rod is bent, the line is moving, and there is electricity-like life deep in the water pulling her line here and there. I give her the thumbs-up sign. She plays the fish correctly, keeping the line very tight but giving the fish room when it surges. It is a tug-of-war battle. Soon, the fish tires, and she pulls line and reaches for her net. The fish pops off. The fly rod snaps back, the line goes limp, and she looks at me, shoulders deflated. Netting the fish always is a precarious time. The rod angle is extreme and barbless hooks, which we always use for the good of the fish, can come out. I silently reach out my palms and shrug my shoulders in a Dad-like “oh well” gesture. She gets it. She takes a few steps forward into the strong current and immediately starts casting. In a few minutes, the process repeats. The fly rod and line are bursting with life, a dramatic battle in the water. And soon, a good-sized rainbow trout is in the net. 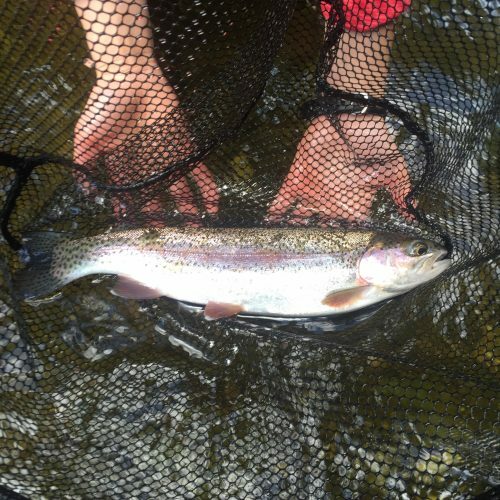 Pictures and words can never fully show the beauty of a live trout, glistening and full of color, as it fiercely tries to break free. My daughter eases out the hook and glances admiringly at the fish. She cradles the fish gently, lifts it out of the net, and places it carefully in the water. The trout bolts. The river narrows at this point, and to get to our spot, we must cross some raging water. Our tactic is that we hold hands and take one step at a time, simultaneously. Two in the current are stronger than one. “One, two, three, step,” I call out and we take a step. On and on. One time, years earlier, we nearly were pulled down-river. We were lucky. The danger adds to the excitement. This time, we make it across with no complications. 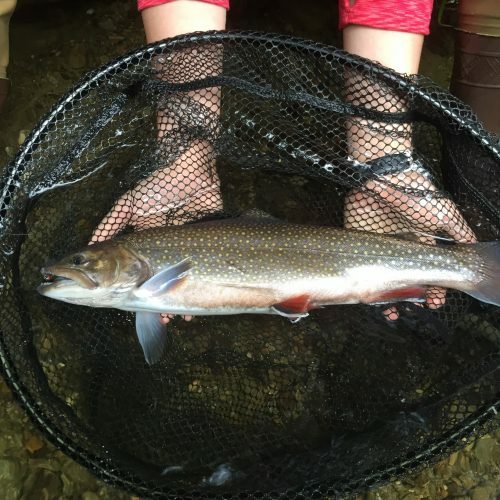 Soon, quite a few brook trout come to the net. “You’re a Fish Hawk,” I say. Back and forth, all day, we are on the water. We walk, wade and criss-cross the river. My daughter, on her own, eventually catches 20 trout that day. It is a fun time, a glorious time. We arrive back at the fishing lodge at the end of the day, shower and eat a hearty dinner. We recount the adventures of the day, the fish she caught, and the ones that got away. We do this for three days straight: getting up early, fishing, eating and talking. Little did I know that this trip would be the essay topic for our daughter’s college applications: fishing with her father. I still remember fondly that trip, at that place where the cleanest of water runs. Now that our daughter is away at college, I do not see her as often. But, the memories live on, and those get me by and by.